A diverse group of people gathered at the University of Exeter’s Environment and Sustainability Institute on Friday 19th October, 2018, to learn about the importance of repair in the circular economy and hear about work that is happening around Cornwall to repair everyday items. The evening included talks from Stefano Pascucci, ESI Professor in Sustainability and Circular Economy, on ‘Community, Circularity and Innovative Practice’, and Pete Halswell, Falmouth & Penryn Repair Café Chair, on ‘The First Cornish Repair Café: Origins and Outlooks’. There was also a pop-up mending session hosted by the Repair Café team and Francli Craftwear, and an opening of a photography exhibition in the ESI Creative Exchange Studio curated by Steve Bond. 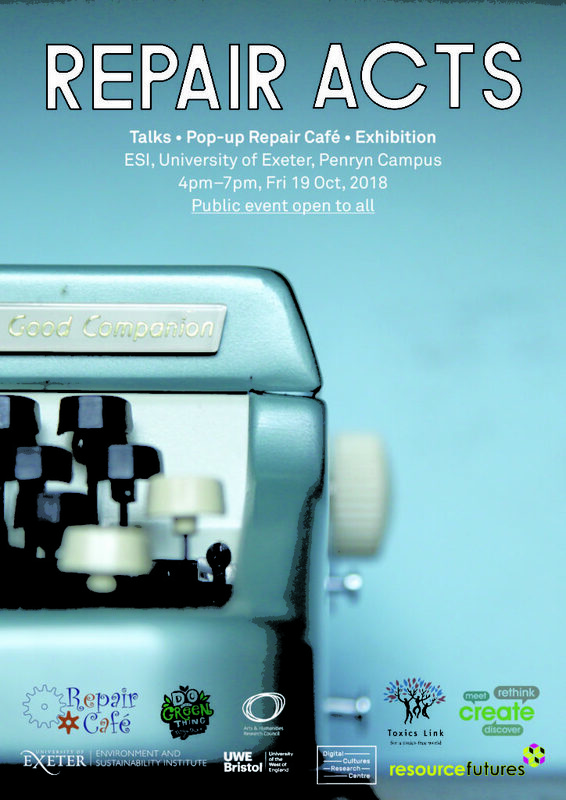 This event was hosted by the Environment and Sustainability Institute in partnership with the Repair Acts Network and Falmouth and Penryn Repair Café, as part of International Repair Café Week.